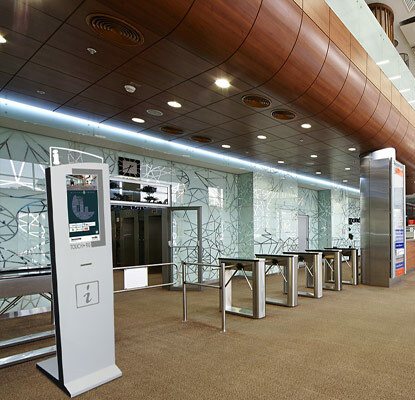 Electronic reception and wayfinding system built on «TouchInform» software automate interaction with «Diamond Hall» visitors. Why does the business center need an electronic reception? get quick feedback from visitors. We solved the stated tasks by implementing an electronic reception and wayfinding system built on «TouchInform» software and interactive kiosks «Platan». 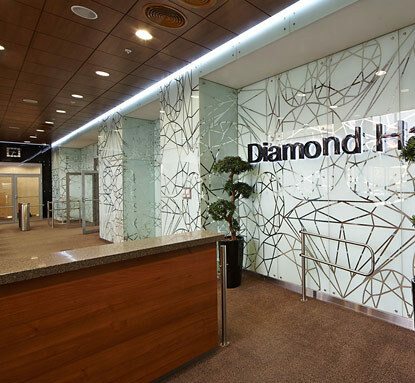 In «Diamond Hall» our engineers created a network of information kiosks and touch monitors that help visitors to navigate in the business center and get the permanent access to all the information on the companies placed there. Our team developed the information system based on the building plan and covering all the areas: offices, cafes, service facilities, elevators, parkings. On digital kiosks visitor can get access to the interactive map, quickly find the desired object and build a shortest way to it. The information system contains the complete data on all the companies reside in the business center including their schedule, contacts and brief information on their activities. To provide interaction with visitors we created the feedback system and the Quality Assessment System. The first one transfers the visitors messages to the «Diamond Hall» administration, the second one allows to rate the quality of ВС services. We even envisaged the possibility of printing all the information about services, rules and safety in BC. The wayfinding system is based on information kiosk «Platan». 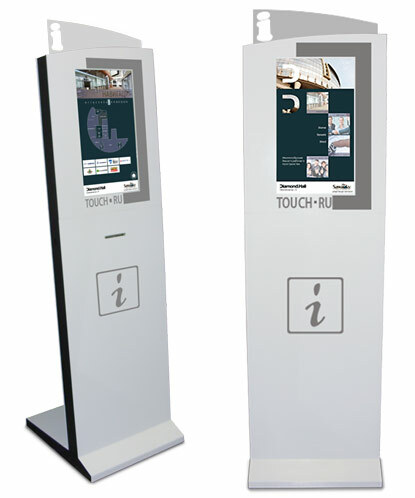 Equipped with multi-touch screen monitors «Electronic receptionist» allows rotate and scale the objects. Safe and reliable kiosks components ensure 24-hours uninterrupted operation. The rugged steel housing can withstand any damage, looks elegant and modern, takes just 1 square meter. Complete description on digital kiosks «Platan» one can find on the manufacturer web site. simple integration with the business center database. The educational center of a new type has opened in Kemerovo region recently. The digital school in Lesnaya Polyana invated in its classes more than thousand children. To educate new generation of children the latest digital technologies and the most modern equipment are used: touch kiosks, multimedia devices, digital laboratories for natural sciences studying and research. To make children better adopt new knowledge and skills the school needed an interactive system that allows learners to find the information on their own. The effective solution was proposed by «Touch Systems» developers. Relying on «TouchInform: Navigator» software and digital kiosks they built the «Interactive guide on Kuzbass region». The system contains historical, geographical data and other interesting information on whole the region and it’s local towns. To involve children in the process of self education the school has launched the «Interactive guide». The project uses touch kiosks, special software and a video wall to present all the information for a large audience. The software part of the solution «Navigator» displays on the touch kiosk map of the Kemerovo region and allows to select any locality on its territory. On the selected city one can get the information card with place description, historical references and sightseeing video. All the data is broadcasted simultaneously on the interactive kiosks and video wall. Both the scholars and their parents have shown their interest to the innovative way of learning with game elements. At the school opening they enjoyed digital kiosks to watch an interesting video about their environments, learn the history of their city. large 55-inch display for exceptional quality images, attracting the children’s attention. Interactive display «Elo-Line» is a modern solution for interactive learning and information system for any educational institution, including schools, playschools, colleges and universities. Leading developer of interactive kiosk software and information systems. © Copyright 2019 «TouchInform» - информационные интерактивные системы для киосков и терминалов.